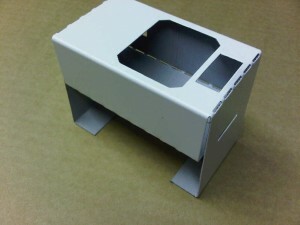 We have manufactured this simple sheet metal enclosure in our production factory in Fareham, Hampshire by CNC punching it from 0.7mm thick pre-coated white mild steel sheet. Some bends have been formed using one of our Trumpf 7036 CNC press brakes, the enclosure was then shipped to our customer in the UK as the first image. They can then insert a small plastic molded lighting sensor in place and wrap the sheet metal enclosure around the sensor. It’s a very simple design idea but enables the sensor to be trapped in the precoated mild steel sheet metal enclosure and once it’s screwed into place the sensor cannot move. 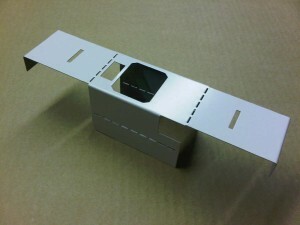 This method of sheet metal design assembly is quick and easy for our customer. They do not need any special tooling and the pre-coated enclosures will be the same size every time as we have pre-defined the size with the CNC punching of slots. I posted an article in February 2011 on the same “easy-bend” technique but then it was being used to reduce space for a customer of ours in the UK who was manufacturing lighting gear trays and wanted to store the sheet metal in a flat pack form until they were ready for assembly. If you can think of a sheet metal component that you are currently having made but may benefit from this CNC punching approach please give us a call and we will be happy to take a look at it for you and manufacture some samples. If you would like to see more examples of CNC punching from our production facilities in Fareham, Hampshire please take a look at our web site plant pages especially, Trumpf 200/3000R CNC punching. Good idea well done if you require Amy machinery please let me know. We have available a very nice Safan ebrake yr 2009 for sale . Hi, I have no need for another press brake at the moment but I am interested in a simple box and pan folder. Is this something you might have?